When Ben was a meat-eater, I’m sure he won’t mind me sharing that one of his favourite meals was that most repulsive of convenience foods – Fray Bentos pie-in-a-tin. With mash and veg. And probably a pint of squash, seeing as he wouldn’t have been old enough to drink. While there are few things he misses about being a carnivore (fish, funnily enough, being one of the only things) he does sometimes reminisce about FB pies with a dreamy, faraway look in his eyes. 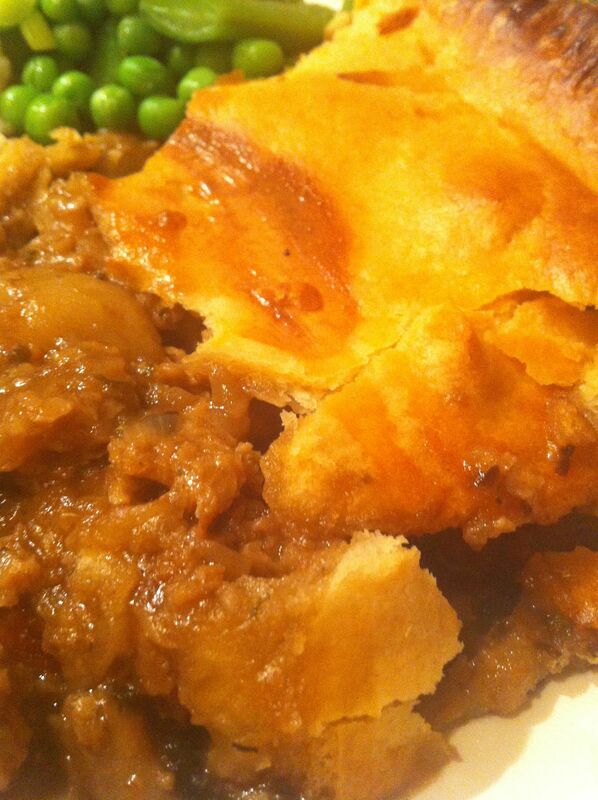 So I decided to challenge myself to make the meatiest non-meat pie I could, and this was the result! First things first – fillings. I wanted something hearty, steaky and gravy-y. No chicken and white sauce over here thanks! Unfortunately, steak is one of the hardest flavours to replicate in vegetarian form and we had sadly run out of seitan – the closest taste/texture we’ve found so far. So, I settled for Sainsburys own ‘meatballs’ with some veggie sausages thrown in for good measure. The sausages were very herby and flavourful and added a hefty meatiness to the mixture without much effort, always a good thing. 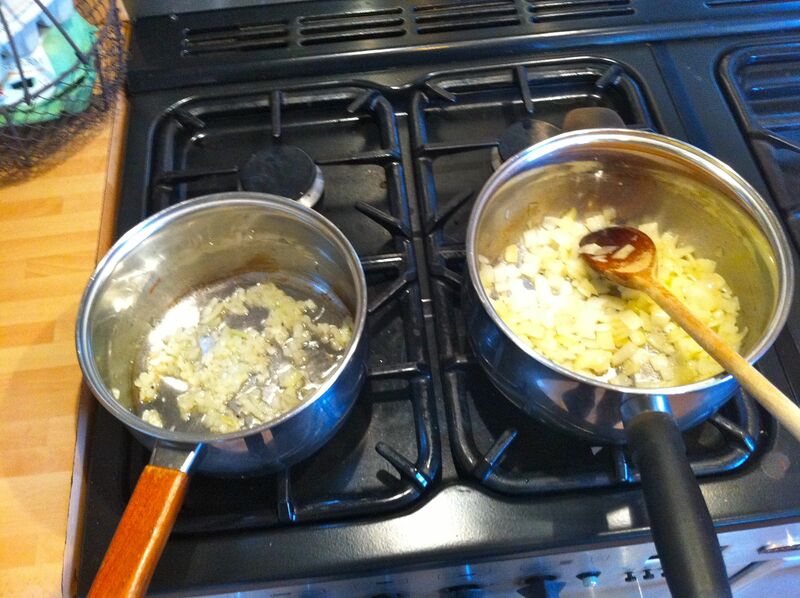 I started, as always, with chopped onions and garlic. I also made myself a little pan of very finely chopped onions and garlic for my own dinner – mushroom-less, pastry-less pie. So basically just pie filling – I’m a bit weird and don’t really like pastry or the shedload of calories it brings to every meal. 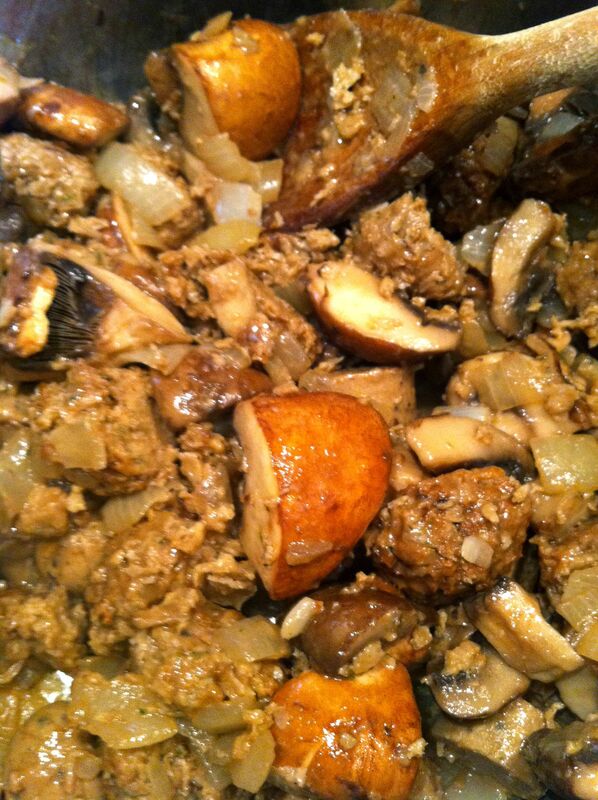 I also despise mushrooms unless they are super finely chopped. A kids version for me! 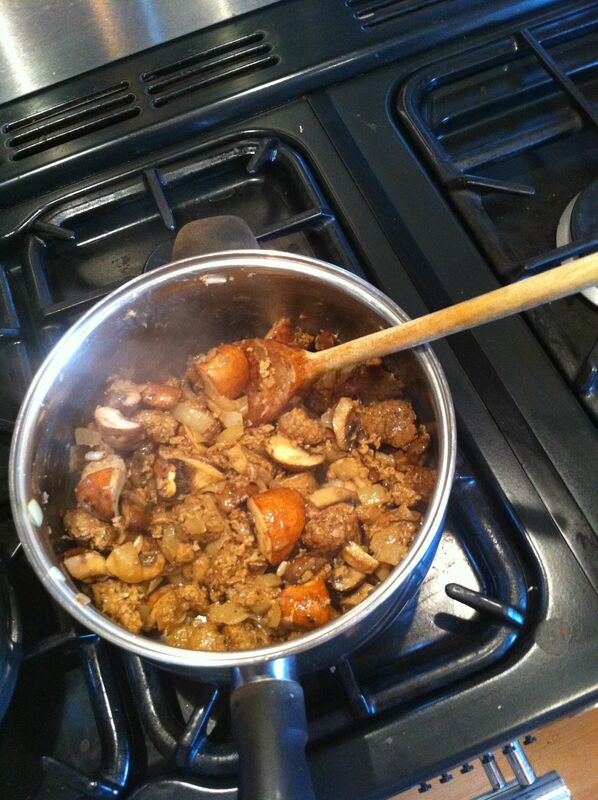 I chopped up the meatballs and sausages and added them into the pan, along with some big chunks of chestnut mushrooms. Then, a selection of seasonings including rosemary, sage, salt and pepper followed by a generous slug of ale. We were slightly overwhelmed by the selection of ales in the supermarket and so plumped for a bottle of bog standard Newcastle Brown Ale. I simmered the mixture for about ten minutes, adding more herbs as I went until it tasted lovely and hearty. I then spooned the mixture into the dish and it filled up nicely, about 3/4’s of the way up the sides. Next came the bit I was nervous about – adding the lid! 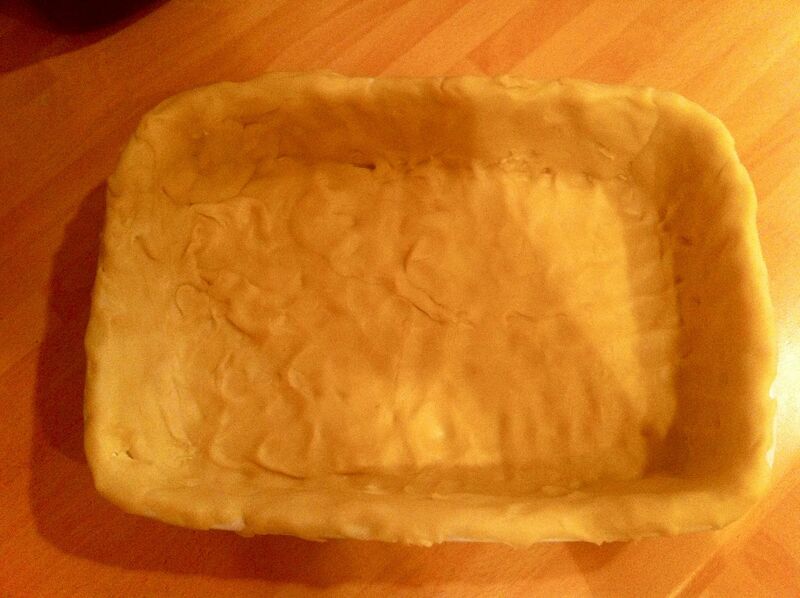 But, it was really simple and with a bit of deft flipping and quick fingers, my pie was lidded. 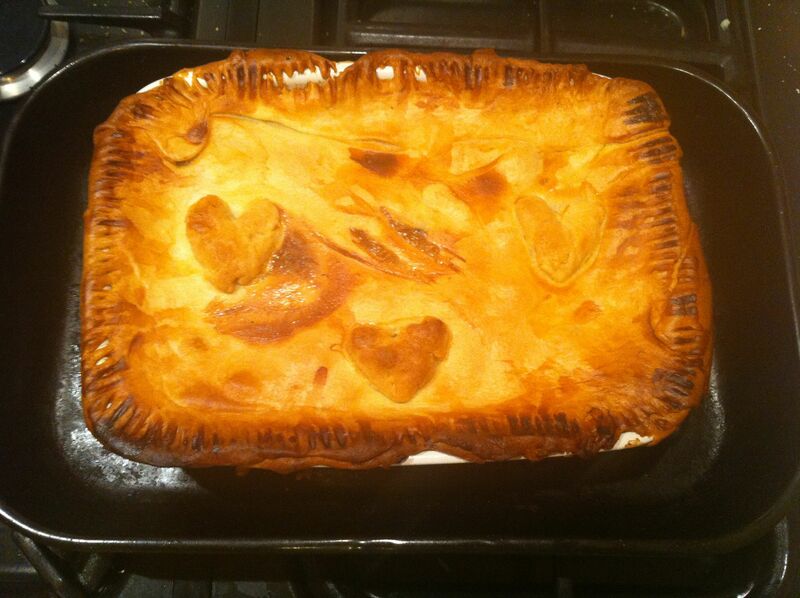 I ‘forked’ the sides to achieve that authentic pie effect and added some hearts to the top with some of the leftover pastry I had. Cute! I brushed the top with milk and it went into the oven. 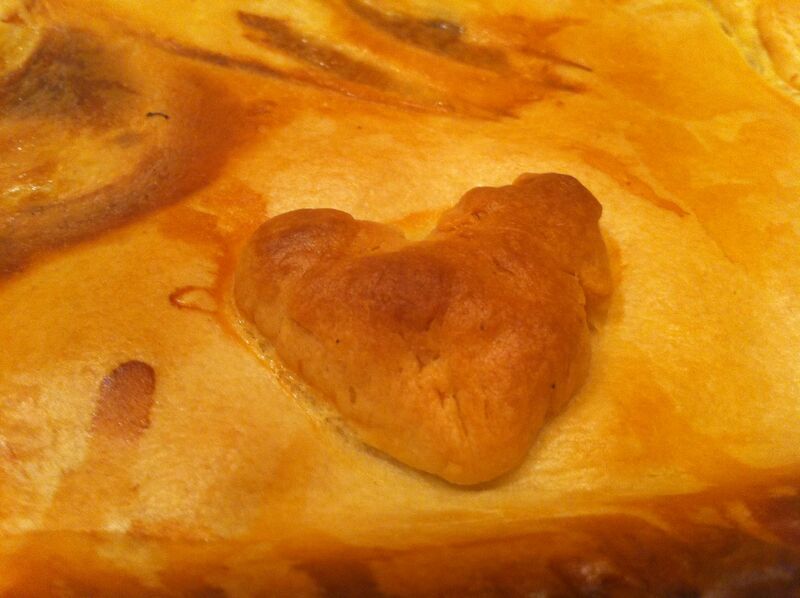 I kept checking to make sure the pastry wasn’t burning but a medium heat seemed to do the trick. It emerged, shiny and golden, 45 minutes later and I cut into it with Ben watching eagerly over my shoulder. Check it out! 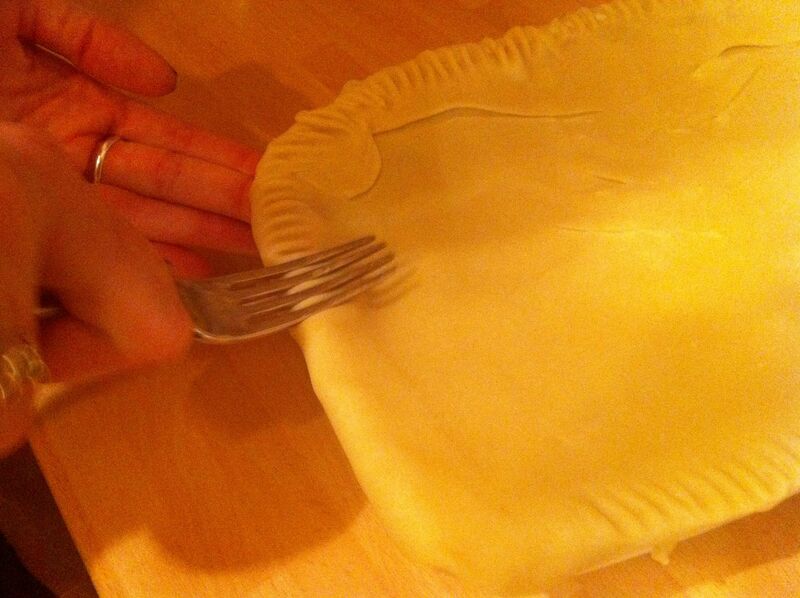 A proper pie!! I served Ben a verrrryyy generous slice onto a plate already bulging with mashed potato, green beans and peas. I whipped up a quick gravy and his dinner was served. My dinner? Don’t worry about me, I had my tasty child-like pie filling and mash and was a very happy girl. A glass of wine helped immensely with this. The filling was thoroughly ‘meaty’ – both in taste and texture. The medley of herbs combined with the reduced-down ale was really tasty and the Quorn meatballs broke apart slightly during cooking, which thickened the sauce. 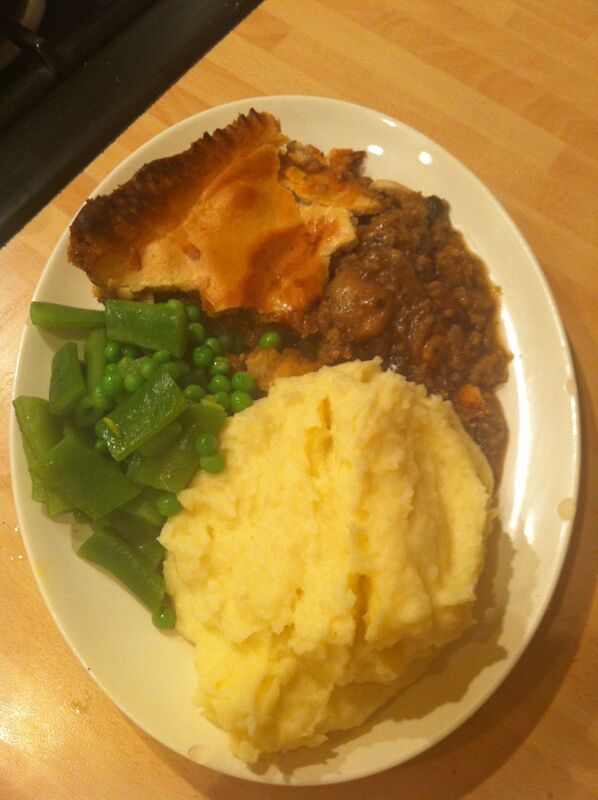 I really feel this is about as meaty as you can get with vegetarian pies – obviously vegetable and non-meat pies are delicious but sometimes it’s nice to just use fake meat as it was intended – a substitute for meat! 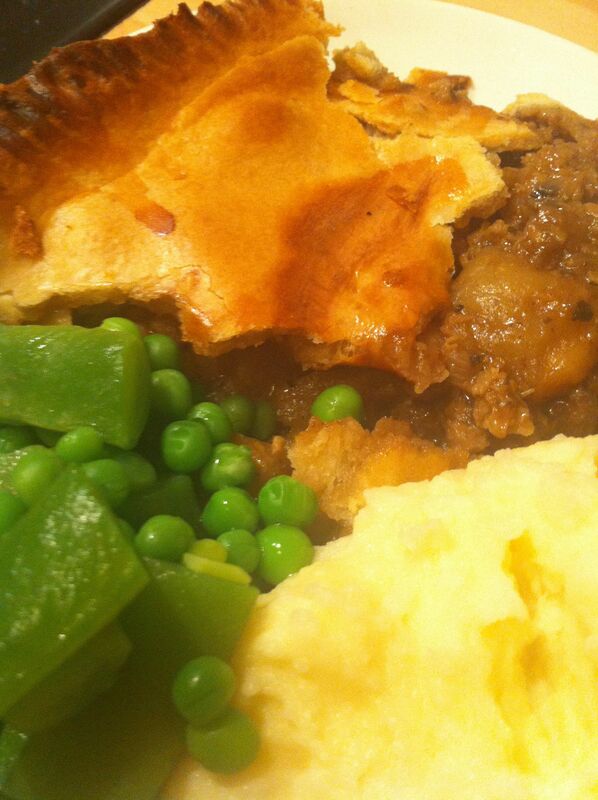 In this instance, Quorn works extremely well and I really recommend this recipe if you or someone you love fancies a proper meat pie!